Buying apps can be great fun, but when you start to stack up $0.99 here and $2.99 there the numbers can quickly build up. Buying apps can be great fun, but when you start to stack up $0.99 here and $2.99 there the numbers can quickly build up. 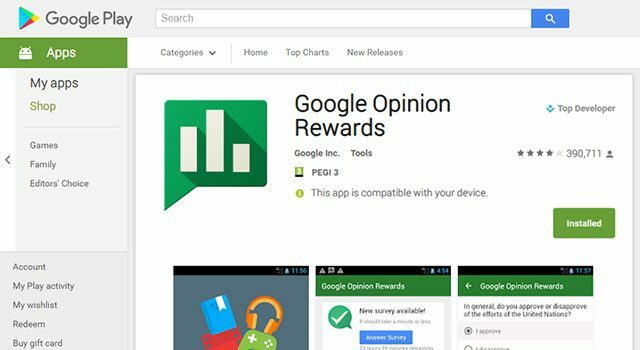 Luckily, with Google Opinion Rewards you can get almost any paid app for free! 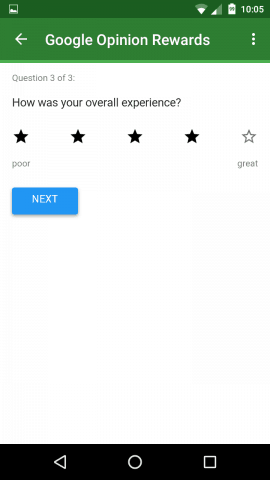 Start by downloading the Google Opinion Rewards app. 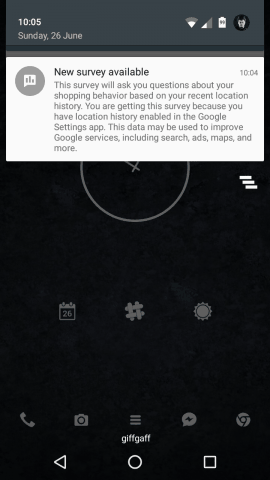 Once installed, the app will send you push notification whenever a survey is available. 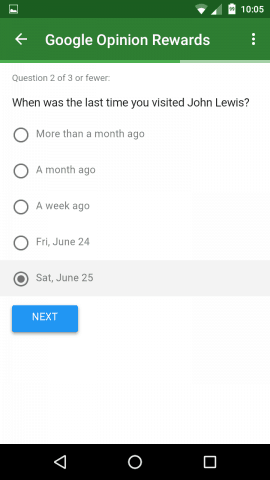 Completing a survey is easy, and most surveys are rarely longer than five quick questions. 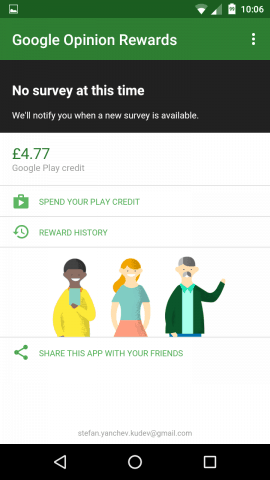 At the end of each survey, you’ll be rewarded with some Google Play credit. It might not seem like a lot, but in my eyes £0.18 ($0.23) is pretty decent considering you can sometimes get more than one survey per day. 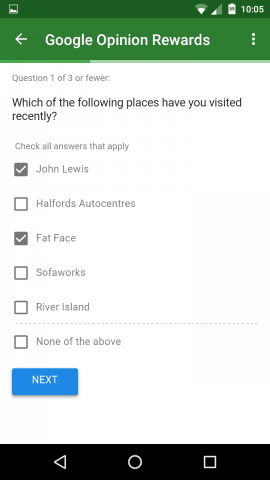 Since most of these surveys are location based, walking around a busy area with lots of retail stores will usually help trigger the polls. Once you’ve racked up some credit, you can spend it as you would normally do. 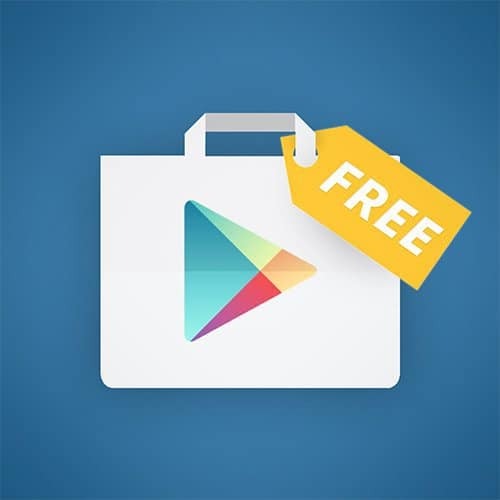 Go to the Play Store, find an app on your wishlist you’d like to buy, or browse the charts to find something new and exciting. 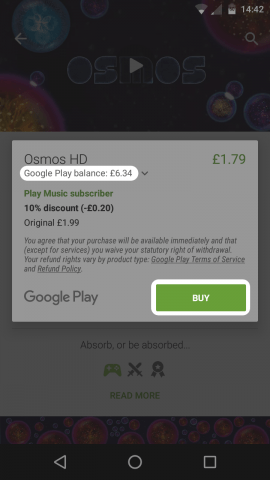 Note that you won’t be able to pay for everything inside of Google Play with your balance. 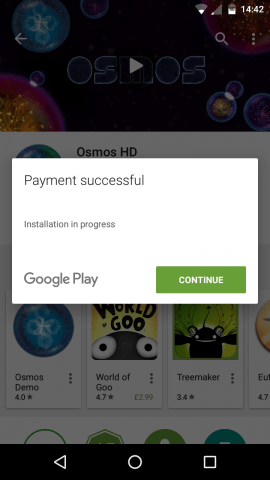 Subscriptions to Google Play Music or any other recurring app subscriptions can only come out of your credit/debit cards. Individual in-app purchases may also fail to come through via your Play balance, but so far most of the ones I’ve tried work fine. 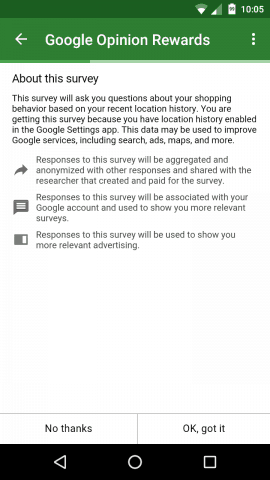 So there you have it, answer quick surveys and get paid in Google Play balance. Plain and straightforward. 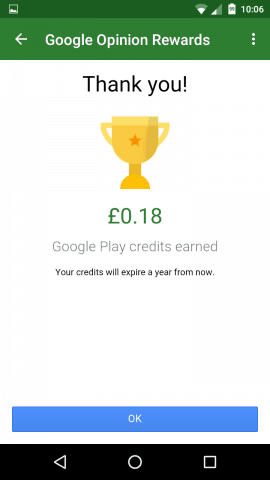 What apps did you get with your free credits? Tell us in the comments below.